A unique feature of Outdoor Craftsmen’s landscape design is the high level of detailed land planning that takes into account the best use of the natural environment, including topography, situational qualities (like steep hillsides or proximity to roadways), and the organic beauty of the place. Many of our clients live on properties that have qualities that call for original and respectful landscape features. 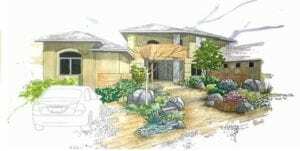 Rocky outcroppings beckon native plantings well-suited to climate extremes; hillside homes require careful design + build to maintain the integrity of the earth’s natural grade, the wind, and water run-off. We are mindful of views, the style of the residence, existing plantings like old-growth trees, native grasses, and other natural resources as we work together with clients to create a sustainable vision of what their finished product will look like and how it will hold up to what nature delivers. Because we view your property holistically, our services can include evaluation of the environmental, economic, and energy efficient benefits possible. Exploring energy use and evaluating efficiency opportunities, we can incorporate sustainable residential landscape architecture practices into your project. This is especially valuable to those living in our areas of service. Contact us today to learn more about how we work with homeowners who are trying to be environmentally aware and responsible.